Draft: 2010, Cleveland Indians, 1st rd. Attended the University of Mississippi. Was named Southeastern Conference Pitcher of the Year and earned AllAmerica honors from the National Collegiate Baseball Writers Association as a junior. Was named a 2005 Freshman AllAmerican and All-SEC Freshman...Married Carolyn Esserman in November 2016...Recieved the Cellular South Ferriss Trophy (now known as the C Spire Ferriss Trophy) in 2010, which is awarded annually to Mississippi's top collegiate baseball player...Drew pitched for the United States Collegiate National Team in the 2009 World Baseball Challenge. He threw a one-hitter in the Championship game against the German National team. He finished the 2009 World Baseball Challenge with a 4-1 record and a 1.75 ERA and a team-leading 48 strikeouts...His older brother, Stuart, was selected in the 2nd round of the 2003 June Draft by STL. His father, Mike, lettered 4 years at Ole Miss. His uncle, Pat, also lettered 4 years at Ole Miss and was selected in the 18th round of the 1983 June Draft by CWS...Was selected in the 12th round of the 2007 MLB Draft by the Texas Rangers, but chose to play college for the University of Mississippi...Participated in events that benefit the Red Sox Foundation, including Picnic in the Park and Casino Night...In spring training 2017, took part in a "Day of Service" at the Family Initiative, Inc., and participated in the Children's Hospital Celebrity Golf Classic. In his second full season with the Red Sox, he went 2-6 with a 6.08 ERA (50er,74.0ip) over 26 outings (11 starts)...His first 11 appearances came as a starter...pitched only in relief from August 10 through the remainder of the season...posted a 5.56 ERA (14er, 22.2ip) over 15 relief appearances...Began 2018 on the 10-day injured list with a left forearm flexor strain...made rehab appearances with triple-A Pawtucket on April 8 (2er, 4.1ip) and for double-A Portland on April 13 (2er, 5.1ip)...Made his ML season debut on April 20 at OAK and received no decision in the Sox' 7-3 win (3er, 3.2ip)...Was placed on the 10-day injured list on June 5 (retro to June 2) due to left biceps tendinitis...Was activated from the injured list on July 24...made 18 appearances (three starts) through the remainder of the season, going 1-3 with a 5.35 ERA (22er, 37.0ip). Set career highs in starts, wins, and innings. The Red Sox were 22-10 in his starts, including 14-4 in his final 18. Made 10 starts against teams that qualified for the postseason, going 6-1 with a 2.62 ERA (16 ER/55.0 IP)...BOS went 9-1 in those games. Posted a 5.29 ERA through his first 7 starts, but went 14-2 with a 2.84 ERA (44 ER/139.2 IP) in 25 starts from 5/20 through the end of the season. Allowed 2 or fewer runs in a ML-leading 23 starts, joining Babe Ruth (28 in 1916) and Roger Clemens (23 in 1990) as the only Red Sox since 1913 with at least 23 such outings in a single season. Pitched 5.0+ innings and allowed 2 ER or fewer in 20 of his starts, throwing 6.0+ innings in 15 of those. Lost only 1 of his 19 starts from 5/20-8/28 (11-1). Posted the longest winning streak by a Red Sox pitcher in 2017 (8-0 in 12 starts from 6/27-8/28)...Was 1 of only 6 ML pitchers with a winning streak of 8+ games. Held opponents to a .211 AVG with RISP (30-for-142), the 5th-lowest mark in the AL and 9th-lowest in MLB. Went 7-3 in 15 road starts... His 3.19 ERA (30 ER/84.2 IP) in those outings was the 6th-lowest in the AL. Won a career-long 7 consecutive road decisions from 5/31-8/28...Was tied for the 2nd-longest road winning streak in the AL in 2017, and the longest by a Red Sox since Clay Buchholz in 2009-10 (9). Began the year on the 10-day DL with a left forearm flexor strain...Reinstated on 4/11. Made his season debut on 4/11 vs. BAL and earned his 1st career win at Fenway Park (6.0 IP, 1 R). Recorded 10 SO in only 4.1 IP on 4/16 vs. TB. Earned his 1st career Interleague win on 4/28 vs. CHC (6.0 IP, 2 R)...Snapped a streak of 27.2 scoreless IP vs. NL Central clubs after allowing a run in the 1st inning. Exited his start on 5/14 vs. TB prior to the 4th inning with left triceps tightness (did not miss his next start)...Issued 3 BB in the outing, snapping a career-long streak of 15 straight starts with 2 or fewer BB. Reached 500.0 career IP on 5/20 at OAK. In 7 road starts from 5/20-7/7, went 4-0 with a 1.99 ERA (9 ER/40.2 IP), allowing either 1 or 2 runs in each. Struck out a career-high-tying 11 batters on 5/25 vs. TEX (2nd time). In 9 starts from 6/16-7/30, went 4-0 with a 2.33 ERA (14 ER/54.0 IP)...Tossed 6.0+ innings in a career-long 4 straight starts from 7/2-19. Allowed 0 HR in 4 consecutive starts from 6/21-7/7. Went 4-0 with a 2.28 ERA (7 ER/27.2 IP) in August, with the Sox winning each of his 5 starts in the month. Set a career high with his 12th win on 8/12 at NYY. Removed from his start on 8/18 vs. NYY (back spasms) after throwing 3.1 scoreless innings. Allowed 2 hits in 5.1 scoreless innings on 8/23 at CLE. Surrendered 2 or fewer ER over 6.0+ IP in 3 consecutive starts from 9/8-19, tied for the longest such streak of his career and longest as a member of the Red Sox. On 9/8 vs. TB, did not give up his 1st hit until there was 1 out in the 5th inning, the deepest he has ever gone into a game without allowing a hit. Allowed 0 runs in 6.1 IP on 9/19 at BAL, his longest scoreless start since 6/25/16 with SD at CIN (7.0 IP). Earned the win in the Sox' AL East title-clinching victory on 9/30 vs. HOU (6.0 IP, 3 H, R, 2 BB, 3 SO). POSTSEASON: Started Game 2 of the ALDS at HOU and earned the loss (2.0 IP, 4 ER, 5 H, BB, SO). Split the season between SD and BOS, going 11-12 with a 3.32 ERA (63 ER/170.2 IP), 186 SO, and a .217 opponent AVG over a career-high 30 starts and 1 relief appearance...Selected by Manager Terry Collins to replace Noah Syndergaard on the NL All-Star roster, his 1st career selection. Ranked among ML leaders in opponent AVG (9th), SO/9.0 IP (10th, 9.81), SO (18th), and ERA (20th). Allowed 2 or fewer ER in 20 of his 30 starts, including 7 starts with 0 ER allowed...Made 6 starts with 0 ER and 3 or fewer hits allowed, tied for 3rd-most in MLB (Kershaw-8, Arrieta-7, Hellickson-6). Ranked among ML leaders on the road with a 2.75 ERA (6th), a .198 opponent AVG (3rd), and 9.47 SO/9.0 IP (16th)...Allowed 2 or fewer runs in 13 of his 16 road starts. Prior to joining BOS, his 1.70 ERA (10 ER/53.0 IP) through 5/23 was the 3rd-lowest through 9 starts in Padres history behind Randy Jones (1.54 in 1975) and Jake Peavy (1.64 in 2007). Won his Padres debut on 4/9 at COL (5.0 IP, 2 ER, 7 SO)...Struck out 10 in his home debut vs. PIT, his 1st career double-digit strikeout performance and the 1st by a Padres left-hander since Eric Stults on 5/29/13 vs. SEA (12). 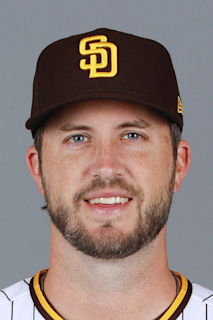 Recorded 31 SO over his first 4 starts with the Padres...According to STATS, was the 3rd-highest total by a Padre through his first 4 starts of a season, trailing only Jake Peavy in 2005 (34) and Stan Spencer in 2000 (32). In 5 May starts, held opponents to a .1452 AVG, the 3rd-best mark among ML qualifiers in the month behind only Marco Estrada (.138) and Clayton Kershaw (.1446). Had a career-best 18.0-inning scoreless streak from 5/1-18...Recorded 10 SO on 5/11 at CHC (6.0 IP, 3 H, 0 R). On 6/25 at CIN, scattered 3 hits over 7.0 shutout innings and went 2-for-3 at the plate with a HR, the 2nd of his career...Became the 1st SD starter to throw 7.0+ shutout innings and hit a HR since Mat Latos on 7/8/10 at WSH. In his final start with SD on 7/7 at LAD, allowed just 2 hits over 7.0 scoreless frames. In the 1st half of the season, started 5 of the 6 games in which the Padres shut out their opponent. Made his All-Star Game debut on 7/12 at Petco Park...Pitched a scoreless 4th inning, retiring Salvador Perez, Jose Altuve, and Mike Trout, and allowing a single to Jackie Bradley Jr. Acquired by the Red Sox from San Diego on 7/14 in exchange for minor league RHP Anderson Espinoza. At the time of his trade on 7/14, led NL starters with a .184 opponent AVG and ranked among ML leaders with a 2.47 ERA (7th), a .288 opponent SLG (4th), and a .555 opponent OPS (2nd)...Was 1 of 4 ML starters with an opponent AVG under .200 and more than 10.0 SO/9.0 IP (10.2), joining Clayton Kershaw, Danny Salazar, and Max Scherzer. Made his Red Sox debut at Fenway Park on 7/20 vs. SF and left with an 8-5 lead (3.0 IP, 5 ER). Allowed 3 or fewer runs in each of 7 starts from 8/4-9/5, a career-long streak...Went 2-2 with a 2.76 ERA (13 ER/42.1 IP) over that stretch, striking out 44 and walking just 14. On 8/10, gave up 1 run in 5.1 IP vs. NYY, his 3rd straight start against the Yankees with 1 or 0 ER allowed. Earned his 1st win with BOS on 8/15 at CLE, allowing 2 ER in a career-high 7.2 IP. On 8/20 at DET, was removed from the game after 5.0 innings as the result of a 1:11 rain delay...Needed only 51 pitches to get through 5.0 innings, allowing just 4 base runners (4 H, 0 BB, 0 HBP) and earning his 10th win. Struck out a career-high 11 batters on 8/25 at TB...Joined Pedro Martinez (3 times) and Josh Beckett (once) as the only Red Sox with 11+ SO in a game at Tropicana Field (later joined by Eduardo Rodriguez). Made his 1st relief appearance of the season on 10/2 vs. TOR, striking out 2 batters over 1.1 perfect frames. POSTSEASON: Pitched in the postseason for the 1st time in his career...Recorded 2.1 scoreless innings of relief in Game 1 of the ALDS at CLE (3 H, BB, 5 SO)...Also appeared in relief in Game 3 (1.1 IP, H, 2 ER, HR, BB, 2 SO). Appeared in a career-high 53 games for Oakland, including nine starts, going 5-6 with a 3.66 ERA (35 ER, 86.0 IP) and 82 strikeouts against 31 walks with a .226 opponents average....Began the season in the starting rotation but was moved to the bullpen following a late May stint on the disabled list…landed on the 15-day DL on 5/20 with a sprained leftAC joint…reinstated on 6/3 after one rehab appearance with Single-A Stockton....After returning from the DL, worked in relief, going 2-0 with a save and a 1.56 ERA and .158 opponents average over his first 20 relief appearances from 6/4-7/18....Made just one start after returning from the DL with a spot start on 7/23 against Toronto on the day Scott Kazmir was traded to HOU....His 82 strikeouts fell one short of his career high from 2012 but his average of 8.58 strikeouts per nine innings was the best mark of his career as was his strikeout-to-walk ratio of 2.65....Was 2-3 with a 4.63 ERA and .244 opponents batting average in nine starts compared to 3-3 with a a 2.61 ERA and .205 opponents average in 44 relief appearances....Allowed a .226 opponents batting average, including .152 (15-for-99) against left-handed hitters compared to .260 (56-for-215) against right-handers. • Made his final appearance on 9/26, missing the final seven games with anAC joint inflammation…underwent surgery on 10/21 in Dallas, performed by Dr. Keith Meister, on his left shoulder. Spent most of the season with the A's and split his time between the bullpen and the starting rotation… was 1-1 with a 1.62 ERA in 10 relief appearances and 4-3 with a 2.58 ERA in 10 starts…combined for a 5-4 record and a 2.35 ERA in 20 games overall…missed 24 games from June 17 to July 12 while on the disabled list and made eight starts with Sacramento from July 12 to Aug. 21…his five wins were a career high as he had just four victories in 34 games entering the season…the ERA was a career low as was his opponents batting average (.204), on-base percentage (.282) and slugging percentage (.304)… his opponents batting average included a .196 (38-for-194) mark by right-handed hitters compared to .232 (13-for-56) by left-handers…entered the season with a .298 career average against righties compared to .165 against lefties…has allowed 22 of his 25 career home runs against righties…five of the seven home runs he allowed in 2014 were solo shots and four came on the first pitch…yielded a .175 batting average with runners in scoring position, including .095 with RISP and two outs…has a .150 (12-for-80) opponents average with RISP and two outs in his career…allowed a .152 average to batters leading off an inning and opponents are hitting .153 (13-for-85) in that situation over the last two years…had a .182 opponents average the first time through the lineup, .221 with five of his seven home runs the second time and .259 after that…opponents hit .146 with two strikes…was 5-4 with a 2.91 ERA and .225 opponents batting average in 17 games, eight starts, before the All-Star Break…did not allow an earned run in three games, two starts, after the break (13.1 ip, 1 r) while holding the opposition to a .109 batting average…had a 0.60 ERA, .155 opponents batting average and one home run in innings one through three, a 4.85 ERA, .237 opponents average and five home runs in innings four through six and a 1.38 ERA, .250 opponents average and one home run from the seventh inning on…surrendered 10 of his 22 runs and four of his seven home runs in the fourth inning (9.00 ERA)…was 1-3 with a 1.42 ERA and .230 opponents batting average in 10 games on the road compared to 4-1 with a 3.48 ERA and .171 opponents average in 10 games at home…compiled a 1.17 ERA in six games during the day, 2.93 in 14 outings at night…stranded all three of his inherited runners and first batters faced were 0-for-9 with a walk…first batters are now 0-for-13 with a walk in his career…had just four career relief appearances entering the season…is now 1-1 with a 1.25 ERA (3 er in 21.2 ip) in 14 career relief appearances, 8-17 with a 4.60 ERA (94 er in 184.0 ip) in 40 career starts…opponents were successful in each of their six stolen base attempts with him on the mound…they are 20-for-23 (87.0%) against him in his career…did not have a pickoff and has just one in his career…tossed five innings or fewer six of his 10 starts…has pitched more than five innings in just 10 of his 40 career starts, including just five with six or more innings… the A's were 5-5 (.500) in his starting assignments and his teams are 15-25 (.375) in his career… allowed two runs or fewer in eight of his 10 starts…surrendered one run or fewer in each of his 10 relief appearances…tossed at least one inning in each of his relief outings, including two or more four times. OAKLAND: Began his fourth professional season and his fourth season in the majors but was on his first Opening Day roster…started the season in the bullpen and made nine relief appearances before moving into the starting rotation…tossed at least one inning in all nine outings and did not allow a run six times…made his first start in the second game of a May 7 doubleheader against Seattle and combined with Otero and Johnson on a three-hit shutout in the A's 2-0 win…it was his first win as a starter since Sept. 26, 2012 against Chicago (NL)…combined on a shutout in each of his first three starts, including an 11-0 blanking of Chicago (AL) May 13 and a 3-0 shutout at Tampa Bay May 20…tossed 5.0 innings in each of the three shutouts and allowed three hits or fewer each time…joins Steve Ontiveros (June 14-24, 1994) as the only A's pitchers since 1914 with three consecutive scoreless outings of five innings or more and three hits or fewer…won all three starts for the first and only winning streak of his career… struck out a career-high eight in his outing against the White Sox…extended his scoreless streak to a career-high 18.0 innings May 25 at Toronto…was 4-1 with a 0.94 ERA and .188 opponents batting average over his first 12 games, including three starts, through May 20…then went 1-3 with a 5.00 ERA and .262 opponents batting average over his next five starts before fracturing his right hand June 16…collected his fifth and final win of the season May 30 against Los Angeles (AL) despite allowing five runs in 5.1 innings…it was his first outing over 5.0 innings since July 27, 2012 against Cincinnati when he also tossed 5.1 innings…that snapped a streak of 20 consecutive starts of five innings pitched or fewer, which was the longest such streak by a Major Leaguer since at least 1914 (previous: Len Barker, 14 from May 21, 1985-June 10, 1987)…finished May with a 4-1 record, a 2.70 ERA and .208 opponents batting average in six games, including five starts…tied for fourth in the AL in wins in the month…tossed a careerhigh 7.0 innings in back-to-back starts June 5 at New York (AL) and June 10 at Los Angeles (AL)…that snapped a streak of 24 consecutive starts dating back to July 15, 2012 in which he tossed fewer than six innings…that was the longest such streak in the majors since at least 1914 (previous: 18, Don Wengert, June 25, 1997-May 26, 2001)…allowed a career-high eight runs in 3.2 innings in a 14-8 loss to Texas June 16…fractured his right wrist following the game and was placed on the 15-day disabled list the next day…made one rehab start with Sacramento before he was reinstated from the DL and optioned to Sacramento July 13…returned to Oakland Aug. 27 and started that day at Houston…allowed one unearned run in 5.1 innings but had a no decision in the A's 5-4 win…was optioned to Class A Beloit the next day but did not appear in a game before returning to Oakland Sept. 2 when the Snappers season concluded…tossed 3.0 scoreless innings of relief that day against Seattle…would pitch just once more, a start for Jason Hammel when he left the team for the birth of his daughter…tossed 5.0 scoreless innings and allowed just one hit but had a no decision in the A's 3-0 loss to Philadelphia Sept. 20. Was 0-4 with a 6.23 ERA in eight games, including four starts, over two stints with Colorado…walked 19 and struck out 19 in 21.2 innings…allowed a .301 opponents batting average, including .130 (3-for-23) against left-handed hitters compared to .367 (22-for-60) against right-handers…issued 16 of his 19 walks and yielded nine of his 10 extra base hits to righties…had a .405 OPS against lefties compared to 1.150 against righties…has a .165 (19-for-115) career average against left-handers compared to .298 (122-for-410) against right-handers…has surrendered 17 of his 18 career home runs to righties for a .500 slugging percentage, compared to .209 against lefties…held opponents to a .190 average with runners in scoring position in 2013, including .091 with RISP and two outs…has a .169 (10-for-59) career average with RISP and two outs…was recalled for the first time June 30 and went 0-4 with an 8.10 ERA and .358 opponents batting average in four starts…walked 18 in 16.2 innings while striking out just 13…was optioned to Colorado Springs July 11 but was recalled July 22 and placed on the disabled list the next day with left biceps tendinitis…was reinstated Sept. 6 and pitched in relief for the first time in his career… did not allow a run while holding opponents to a .063 batting average in four relief outings (5.0 ip, 1 h, 1 bb, 6 so)…did not inherit a runner and retired all four of his first batters faced…was 0-2 with a 4.61 ERA and .255 opponents average in six games at Coors Field, 0-2 with a 9.00 ERA and .375 opponents average in two starts on the road…his career splits are 2-7 with a 4.40 ERA (37 er in 75.2 ip) in 19 games at home compared to 2-7 with a 6.20 ERA (42 er in 61.0 ip) in 15 games on the road…opponents batted .158 when leading off an inning…tossed 4.1 innings or fewer, allowed three runs or more and walked four batters or more in each of his four starts. COLORADO SPRINGS: Began the season at Triple-A Colorado Springs and went 8-1 with a 4.20 ERA in 15 starts before the Rockies called June 30…struck out 96 batters in 85.2 innings, an average of 10.1 per nine innings…yielded just six home runs, an average of 0.63 per nine innings … despite spending just three months with the Sky Sox, he led the club in wins and strikeouts … allowed a .256 opponents batting average, including .180 (18-for-100) against left-handed hitters compared to .290 (65-for-224) against right-handers…however, surrendered four of his six home runs to lefties … opponents hit .217 with the bases empty compared to .306 with runners on base…including .329 with runners in scoring position…logged a 1.20 ERA in the first inning and had a 3.00 ERA over the first four innings of a game compared to 7.01 from the fifth inning on…the Sky Sox were 13-2 (.867) in his starting assignments … tossed six or more innings in six of his 15 starts, allowed two runs or fewer eight times and walked two batters or fewer 10 times…did not allow a run in two of his first three starts … including April 13 at Las Vegas when he allowed a season high six runs on a season-high nine hits in 5.0 innings…picked up his first win of the season in that game, an 11-6 Sky Sox victory…went 4-0 with a 2.54 ERA in five starts in the month of April…extended his season-opening winning streak to six games May 16 at Round Rock … had a 3.22 ERA over that eight-start stretch…was charged with his only loss of the season May 21 at Albuquerque and went 2-1 with a 5.27 ERA over his final seven Triple-A starts…walked a season-high four batters May 26 against Fresno…matched his season high with four walks in a season-low 4.0 innings June 11 against Salt Lake…struck out a season-high 11 batters in 6.2 shutout innings June 16 at Las Vegas…left with a 6-0 lead but had a no decision in a 9-7 win…tossed a season-high 7.0 innings for the win in his final Triple-A start June 21 against Tacoma … ranked second in the Pacific Coast League in wins (8) and strikeouts (96) at the time of his promotion to Colorado June 30…was optioned to Colorado Springs July 11 but did not appear in a game before he was sent to Double-A Tulsa July 16…started and lost that day against Northwest Arkansas (5.1 ip, 10 h, 7 r, 7 er, 1 bb, 5 so)…recalled by Colorado July 22 and was placed on the DL the next day. Pomeranz made 22 starts for the Rockies in what was his official rookie season in the Majors...over the last two seasons, Pomeranz has started 26 games in the Majors, all before his 24th birthday. In 22 starts for the Rockies, Pomeranz finished with a 2-9 record and a 4.93 ERA (96.2 ip, 53) while walking 46 andstriking out 83...was optioned to Triple-A on 5/11 after making five starts for the Rockies...went 4-4 with a 2.51 ERA (46.2ip, 13 er), 20 walks and 46 strikeouts in nine starts after being optioned...following his return to the Majors, Drew went2-7 with a 5.01 ERA (73.2 ip, 41 er) in 17 starts. Pomeranz made 11 starts at Coors Field in 2012, going 1-5 with a 4.91 ERA (51.1 ip, 28 er), 28 walks, 40 strikeoutsand an opponents' average of .265 (53-for-200)...only 18 of his 53 hits allowed went for extra bases...Pomeranz had a3.16 run support average in those 11 starts...Pomeranz earned his first career win at Coors Field on 9/26 vs. CHC aftertossing 5.0 shutout innings. Pomeranz made 11 road starts in 2012 on the road, going 1-4 with a 4.96 ERA (45.1 ip, 25 er)...in his last four roadstarts he allowed seven runs over 15.0 ip...Pomeranz allowed three-runs-or-less in eight of his 11 road starts...in theother three he allowed 15 runs in 10.0 innings (7/20 at SD, 8/11 at SF and 9/15 at SD). In four starts from 5/2-7/6 Pomeranz went 1-2 with a 1.64 ERA (22.0 ip, 4 er), 12 walks and 14 strikeouts...he was givenjust seven runs of support in the four starts (2.86 RSA) while the Rockies went 2-2 in those four games (2 road games,2 home games). Pomeranz's last game in the stretch was perhaps the best start of his Major League career on 7/6 at WAS...in that gamehe allowed just one hit and 2 walks while striking out 6 in 6.1 innings to defeat Nationals' starter Stephen Strasburg. One game prior to that on 7/1 vs. SD he took a hard luck loss by allowing just 2 hits and one run in 6.0 innings. Pomeranz was optioned 3/30 during Spring Training and made his first start of the season with Double-A Tulsa on4/10/12...in that start, the left-hander went 4.0 innings allowing no runs on four hits and one walk while striking outfour...since being traded to the Rockies in 2011, Drew has three minor league starts with Tulsa, going 1-0 with a 0.00ERA (14.0 ip), six hits, one walk and 11 strikeouts. He tossed at least 5.0 innings in nine of his 22 starts in 2012...in those nine starts he went 2-3 with a 2.74 ERA (49.1ip, 15 er), 21 walks, 39 strikeouts and a .172 opponents average. Selected by the Cleveland Indians in the 1st round (5th overall) of the June draft.Pro Career...Did not pitch competitively at the professional level after signing at the deadline on August 16....Did pitch in the FallInstructional League in Goodyear, AZ. January 23, 2019 San Francisco Giants signed free agent LHP Drew Pomeranz. October 29, 2018 LHP Drew Pomeranz elected free agency. July 24, 2018 Boston Red Sox activated LHP Drew Pomeranz from the 10-day disabled list. July 2, 2018 Boston Red Sox sent LHP Drew Pomeranz on a rehab assignment to Pawtucket Red Sox. June 5, 2018 Boston Red Sox placed LHP Drew Pomeranz on the 10-day disabled list retroactive to June 2, 2018. Left biceps tendinitis. April 20, 2018 Boston Red Sox activated LHP Drew Pomeranz from the 10-day disabled list. April 9, 2018 Boston Red Sox sent LHP Drew Pomeranz on a rehab assignment to Portland Sea Dogs. April 8, 2018 Boston Red Sox sent LHP Drew Pomeranz on a rehab assignment to Pawtucket Red Sox. March 26, 2018 Boston Red Sox placed LHP Drew Pomeranz on the 10-day disabled list. Left forearm flexor strain. April 11, 2017 Boston Red Sox activated LHP Drew Pomeranz from the 10-day disabled list. March 30, 2017 Boston Red Sox placed LHP Drew Pomeranz on the 10-day disabled list. July 17, 2016 Boston Red Sox activated LHP Drew Pomeranz. July 14, 2016 San Diego Padres traded LHP Drew Pomeranz to Boston Red Sox for RHP Anderson Espinoza. June 3, 2015 Oakland Athletics activated LHP Drew Pomeranz from the 15-day disabled list. May 31, 2015 Oakland Athletics sent LHP Drew Pomeranz on a rehab assignment to Stockton Ports. September 2, 2014 Oakland Athletics recalled LHP Drew Pomeranz from Beloit Snappers. August 28, 2014 Oakland Athletics optioned LHP Drew Pomeranz to Beloit Snappers. August 27, 2014 Oakland Athletics recalled Drew Pomeranz from Sacramento River Cats. July 13, 2014 Oakland Athletics optioned LHP Drew Pomeranz to Sacramento River Cats. July 12, 2014 Oakland Athletics sent LHP Drew Pomeranz on a rehab assignment to Sacramento River Cats. June 17, 2014 Drew Pomeranz roster status changed by Oakland Athletics. December 10, 2013 Oakland Athletics traded LHP Brett Anderson and cash to Colorado Rockies for LHP Drew Pomeranz and RHP Chris Jensen. September 6, 2013 Drew Pomeranz roster status changed by Colorado Rockies. July 26, 2013 Colorado Rockies placed LHP Drew Pomeranz on the 15-day disabled list retroactive to July 23, 2013. Left bicep tendinitis. July 22, 2013 Colorado Rockies recalled LHP Drew Pomeranz from Tulsa Drillers. July 16, 2013 Drew Pomeranz assigned to Tulsa Drillers from Colorado Springs Sky Sox. July 12, 2013 Colorado Rockies optioned Drew Pomeranz to Colorado Springs Sky Sox. June 30, 2013 Colorado Rockies recalled Drew Pomeranz from Colorado Springs Sky Sox. March 25, 2013 Colorado Rockies optioned Drew Pomeranz to Colorado Springs Sky Sox. July 1, 2012 Colorado Rockies recalled Drew Pomeranz from Colorado Springs Sky Sox. May 11, 2012 Colorado Rockies optioned Drew Pomeranz to Colorado Springs Sky Sox. April 15, 2012 Colorado Rockies recalled Drew Pomeranz from Tulsa Drillers. April 9, 2012 Drew Pomeranz assigned to Tulsa Drillers from Colorado Springs Sky Sox. March 30, 2012 Colorado Rockies optioned Drew Pomeranz to Colorado Springs Sky Sox. September 11, 2011 Colorado Rockies selected the contract of Drew Pomeranz from Tulsa Drillers. September 5, 2011 Drew Pomeranz roster status changed by Tulsa Drillers. August 23, 2011 Tulsa Drillers placed LHP Drew Pomeranz on the 7-day disabled list. Appendectomy. August 17, 2011 AZL Indians traded LHP Drew Pomeranz to Tulsa Drillers. August 6, 2011 Drew Pomeranz assigned to AZL Indians from Akron Aeros. July 13, 2011 Drew Pomeranz assigned to Akron Aeros from Kinston Indians. April 4, 2011 Drew Pomeranz assigned to Kinston Indians from Cleveland Indians. January 13, 2011 Cleveland Indians invited non-roster LHP Drew Pomeranz to spring training. August 16, 2010 Cleveland Indians signed LHP Drew Pomeranz.